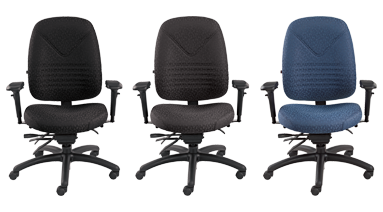 The Chevron Ultra has the same great ergonomic features as the original Chevron with added fully adjustable/articulating arms, a wider, more contoured seat, a taller back with 5-1/4" of back height adjustment and a new "soft descent" seat height adjustment. Medium Back. Features width adjustable arms, infinite position back angle adjustment, tilt tension adjustment, infinite position tilt lock control, adjustable seat angle and seat depth adjustment. Waterfall seat front. Fusion Fabric. Graphite.